I didn’t really do that much today, now that I think of it, but for some reason it just felt like a crazy day. If your house is anything like mine, 5:00pm is the “bewitching hour” where the kids are bored and tired after a long day and mom is not in the mood to deal with it, and is trying to get dinner going (right? I’m not the only one, right??). 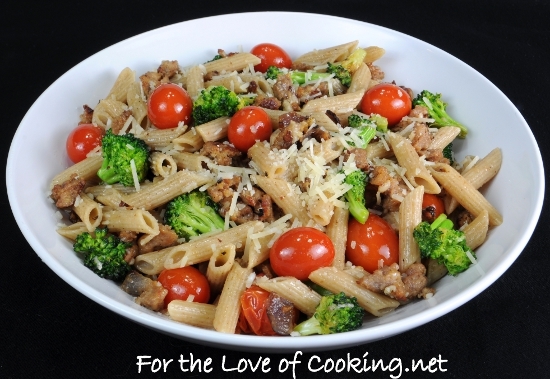 So luckily this meal is pretty easy to throw together with what you have lying around, and it is quick start to finish. I made a few changes to this original recipe – I didn’t have sausage so I left it out, I used a white onion instead of red, I doubled the broccoli amount, and I added a bit of ricotta cheese at the end (because I had to use it up!). Cook the penne pasta per instructions in salted boiling water. While the pasta cooks, heat the olive oil in a large skillet over medium heat. Add the sausage, removed from casings, along with the red onion. Cook the sausage and onion for 4-5 minutes, stirring often, making sure to break up the sausage into crumbles as it cooks. Add the broccoli florets, the grape tomatoes, and crushed red pepper and continue to cook for 5 minutes, stirring often. Add the garlic then cook, stirring constantly for 1 minute. Add the cooked and drained pasta and the reserved pasta liquid to the pan then drizzle some olive oil on to the pasta as well as the butter, Parmesan cheese, sea salt, and freshly cracked pepper to taste. Gently mix until evenly coated. Taste and re-season if necessary. Serve immediately. Enjoy. Me: I really liked it a lot. Sometimes marinara sauce can get a little mundane so it’s nice to switch up the flavors. The vegetables added a nice crunch. The Mr.: Missed out on this one! He’ll have to have it for lunch tomorrow. The Wild One: He ate it but wasn’t super interested. He’s not a huge pasta lover (and that’s ok). Tornado: Ate it all! And tried to steal broccoli off my plate.